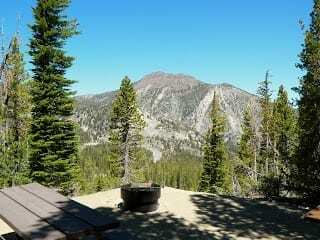 Trailhead: Take Hwy 89 South from Tahoe City about 11 miles to the Meeks Bay Resort. Park in a small lot across the highway from the resort. A wilderness permit is required. Description: After following a road for approximately 1.3 miles, the trail passes a small spring, parallels Meeks Creek and continues upward into a forested valley. A chain of alpine lakes can be seen before the trail ascends 1,000 feet up a series of switchbacks leading to Phipps Pass. Trail is 4.5 miles to Lake Genevieve, 5 to Crag, 5.7 to Hidden, 5.9 to Shadow, 6.3 miles to Stony Ridge, and 8 miles to Rubicon. This hike is part of an unofficial Tahoe-Yosemite Trail.